Blue Chamomile Shea Butter Body Lotion. 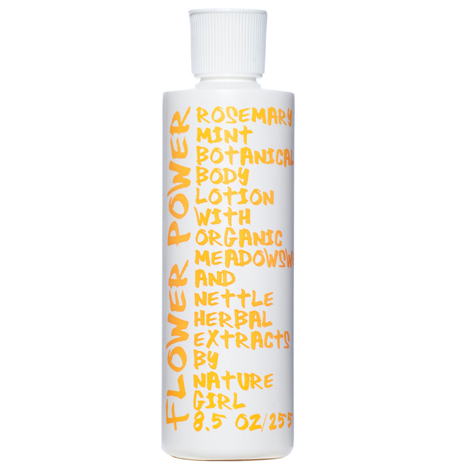 A rich, emollient and soothing botanical body lotion... NATURE GIRL SHEA BUTTER BODY LOTION CREME CORPS HYDRATANTE AU BEURRE DE KARITE 8.5 FL.OZ 255 ML A rich, emollient and soothing botanical body lotion made with wildcrafted African shea nut butter, sea algae extract, aloe vera and organic flower petal extracts to moisturize, protect and nourish skin. Scent: Blue Chamomile Directions: Apply to whole body as a daily moisturizer to hydrate, condition and protect the skin. Jasmine Lime Shea Butter Body Lotion. A rich, emollient and soothing botanical body lotion made... NATURE GIRL SHEA BUTTER BODY LOTION CREME CORPS HYDRATANTE AU BEURRE DE KARITE 8.5 FL.OZ 255 ML A rich, emollient and soothing botanical body lotion made with wildcrafted African shea nut butter, sea algae extract, aloe vera and organic flower petal extracts to moisturize, protect and nourish skin. Scent: Jasmine Lime Directions: Apply to whole body as a daily moisturizer to hydrate, condition and protect the skin. Lavender Orris Shea Butter Body Lotion. A rich, emollient and soothing botanical body lotion... NATURE GIRL SHEA BUTTER BODY LOTION CREME CORPS HYDRATANTE AU BEURRE DE KARITE 8.5 FL.OZ 255 ML A rich, emollient and soothing botanical body lotion made with wildcrafted African shea nut butter, sea algae extract, aloe vera and organic flower petal extracts to moisturize, protect and nourish skin. Scent: Lavender Orris Directions: Apply to whole body as a daily moisturizer to hydrate, condition and protect the skin. Orange Blossom Shea Butter Body Lotion. A rich, emollient and soothing botanical body lotion... NATURE GIRL SHEA BUTTER BODY LOTION CREME CORPS HYDRATANTE AU BEURRE DE KARITE 8.5 FL.OZ 255 ML A rich, emollient and soothing botanical body lotion made with wildcrafted African shea nut butter, sea algae extract, aloe vera and organic flower petal extracts to moisturize, protect and nourish skin. Scent: Orange Blossom Directions: Apply to whole body as a daily moisturizer to hydrate, condition and protect the skin. Tangerine Shea Butter Body Lotion. A rich, emollient and soothing botanical body lotion... NATURE GIRL SHEA BUTTER BODY LOTION CREME CORPS HYDRATANTE AU BEURRE DE KARITE 8.5 FL.OZ 255 ML A rich, emollient and soothing botanical body lotion made with wildcrafted African shea nut butter, sea algae extract, aloe vera and organic flower petal extracts to moisturize, protect and nourish skin. Scent: Tangerine Directions: Apply to whole body as a daily moisturizer to hydrate, condition and protect the skin. A luxe and gentle botanical body cleanser made with aloe vera leaf and extracts from organic... NATURE GIRL BOTANICAL BODY WASH BAIN DOUCHE HYDRATANTE POUR LE CORPS 8.5 FL.OZ 255 ML A luxe and gentle botanical body cleanser made with aloe vera leaf and extracts from organic and wildcrafted plants and flowers to moisturize, nurture and protect the skin. Sulfate free. Scent: Blue Chamomile Directions: Apply to whole body as a daily cleanser in shower or bath. A luxe and gentle botanical body cleanser made with aloe vera leaf and extracts from organic... NATURE GIRL BOTANICAL BODY WASH BAIN DOUCHE HYDRATANTE POUR LE CORPS 8.5 FL.OZ 255 ML A luxe and gentle botanical body cleanser made with aloe vera leaf and extracts from organic and wildcrafted plants and flowers to moisturize, nurture and protect the skin. Sulfate free. Scent: Jasmine Lime Directions: Apply to whole body as a daily cleanser in shower or bath. 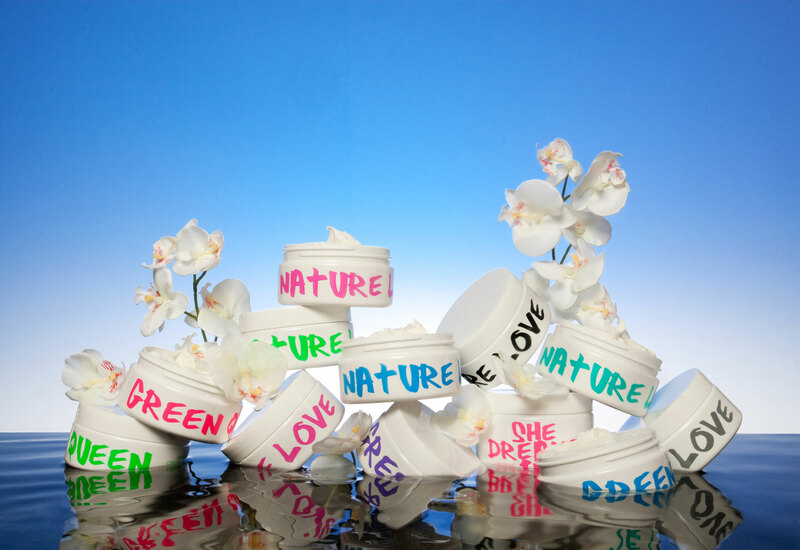 A luxe and gentle botanical body cleanser made with aloe vera leaf and extracts from organic... NATURE GIRL BOTANICAL BODY WASH BAIN DOUCHE HYDRATANTE POUR LE CORPS 8.5 FL.OZ 255 ML A luxe and gentle botanical body cleanser made with aloe vera leaf and extracts from organic and wildcrafted plants and flowers to moisturize, nurture and protect the skin. Sulfate free. Scent: Lavender Orris Directions: Apply to whole body as a daily cleanser in shower or bath. A luxe and gentle botanical body cleanser made with aloe vera leaf and extracts from organic... NATURE GIRL BOTANICAL BODY WASH BAIN DOUCHE HYDRATANTE POUR LE CORPS 8.5 FL.OZ 255 ML A luxe and gentle botanical body cleanser made with aloe vera leaf and extracts from organic and wildcrafted plants and flowers to moisturize, nurture and protect the skin. Sulfate free. Scent: Orange Blossom Directions: Apply to whole body as a daily cleanser in shower or bath. A luxe and gentle botanical body cleanser made with aloe vera leaf and extracts from organic... NATURE GIRL BOTANICAL BODY WASH BAIN DOUCHE HYDRATANTE POUR LE CORPS 8.5 FL.OZ 255 ML A luxe and gentle botanical body cleanser made with aloe vera leaf and extracts from organic and wildcrafted plants and flowers to moisturize, nurture and protect the skin. Sulfate free. Scent: Tangerine Directions: Apply to whole body as a daily cleanser in shower or bath. 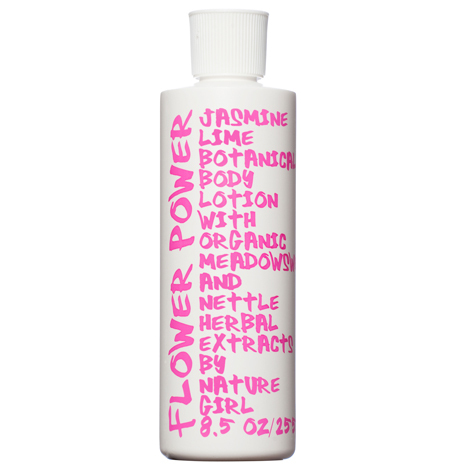 Jasmine Lime Botanical Body Lotion with organic herbal extracts. 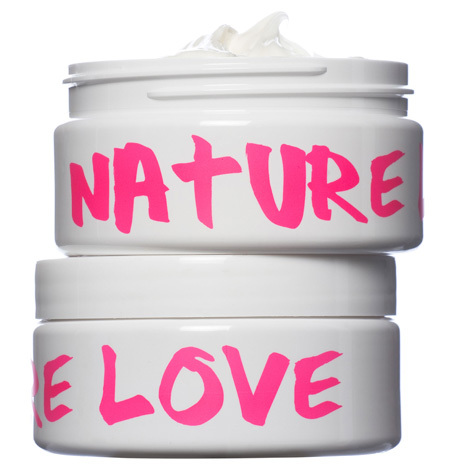 A soothing daily moisturizer made... FLOWER POWER BOTANICAL BODY LOTION WITH ORGANIC HERBAL EXTRACTS CREME CORPS AVEC HUILES ESSENTIELLES ET EXTRAITS NATURELS DE PLANTES 8.5 FL.OZ 255 ML A soothing daily moisturizer made with certified organic shea butter, wildcrafted foraha nut oil and organic herbal extracts to hydrate, replenish and condition the skin. Scent: Jasmine Lime - Pink Design Directions: Apply to whole body as a daily moisturizer to nurture and protect the skin. 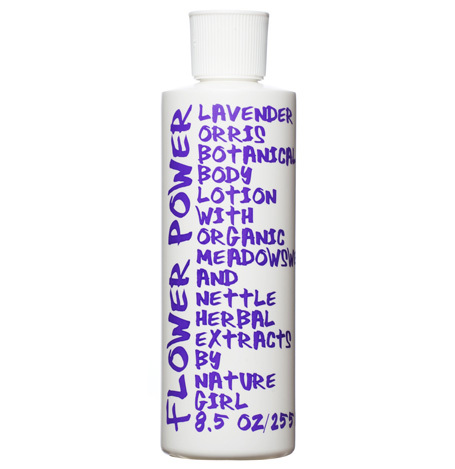 Lavender Orris Botanical Body Lotion with organic herbal extracts. A soothing daily moisturizer made... FLOWER POWER BOTANICAL BODY LOTION WITH ORGANIC HERBAL EXTRACTS CREME CORPS AVEC HUILES ESSENTIELLES ET EXTRAITS NATURELS DE PLANTES 8.5 FL.OZ 255 ML A soothing daily moisturizer made with certified organic shea butter, wildcrafted foraha nut oil and organic herbal extracts to hydrate, replenish and condition the skin. Scent: Lavender Orris Directions: Apply to whole body as a daily moisturizer to nurture and protect the skin. 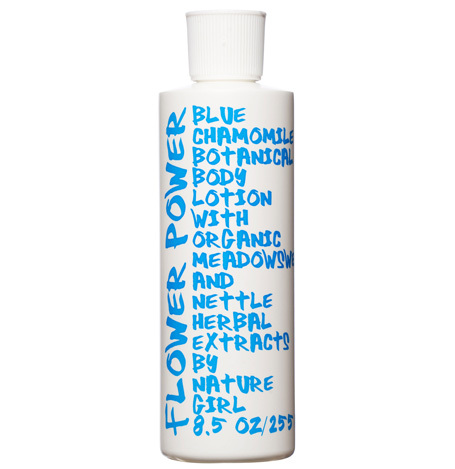 Blue Chamomile Botanical Body Lotion with organic herbal extracts. A soothing daily moisturizer made... FLOWER POWER BOTANICAL BODY LOTION WITH ORGANIC HERBAL EXTRACTS CREME CORPS AVEC HUILES ESSENTIELLES ET EXTRAITS NATURELS DE PLANTES 8.5 FL.OZ 255 ML A soothing daily moisturizer made with certified organic shea butter, wildcrafted foraha nut oil and organic herbal extracts to hydrate, replenish and condition the skin. Scent: Blue Chamomile Directions: Apply to whole body as a daily moisturizer to nurture and protect the skin. 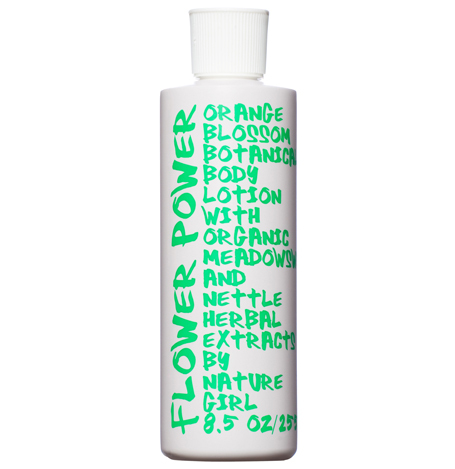 Orange Blossom Botanical Body Lotion with organic herbal extracts. A soothing daily moisturizer made... FLOWER POWER BOTANICAL BODY LOTION WITH ORGANIC HERBAL EXTRACTS CREME CORPS AVEC HUILES ESSENTIELLES ET EXTRAITS NATURELS DE PLANTES 8.5 FL.OZ 255 ML A soothing daily moisturizer made with certified organic shea butter, wildcrafted foraha nut oil and organic herbal extracts to hydrate, replenish and condition the skin. Scent: Orange Blossom Directions: Apply to whole body as a daily moisturizer to nurture and protect the skin. Tangerine Botanical Body Lotion with organic herbal extracts. A soothing daily moisturizer made... FLOWER POWER BOTANICAL BODY LOTION WITH ORGANIC HERBAL EXTRACTS CREME CORPS AVEC HUILES ESSENTIELLES ET EXTRAITS NATURELS DE PLANTES 8.5 FL.OZ 255 ML A soothing daily moisturizer made with certified organic shea butter, wildcrafted foraha nut oil and organic herbal extracts to hydrate, replenish and condition the skin. Scent: Ylang Ylang Directions: Apply to whole body as a daily moisturizer to nurture and protect the skin. Tangerine Botanical Body Lotion with organic herbal extracts. A soothing daily moisturizer made... 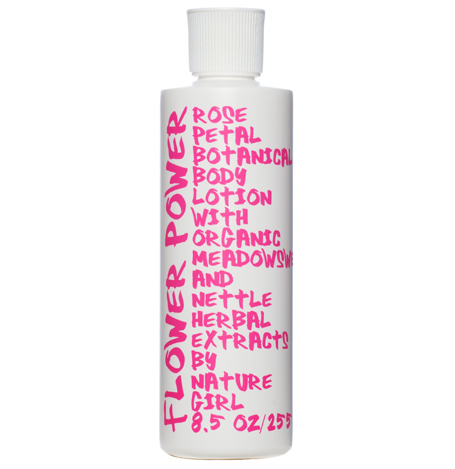 FLOWER POWER BOTANICAL BODY LOTION WITH ORGANIC HERBAL EXTRACTS CREME CORPS AVEC HUILES ESSENTIELLES ET EXTRAITS NATURELS DE PLANTES 8.5 FL.OZ 255 ML A soothing daily moisturizer made with certified organic shea butter, wildcrafted foraha nut oil and organic herbal extracts to hydrate, replenish and condition the skin. Scent: Vanilla Litsea Directions: Apply to whole body as a daily moisturizer to nurture and protect the skin. Tangerine Botanical Body Lotion with organic herbal extracts. A soothing daily moisturizer made... 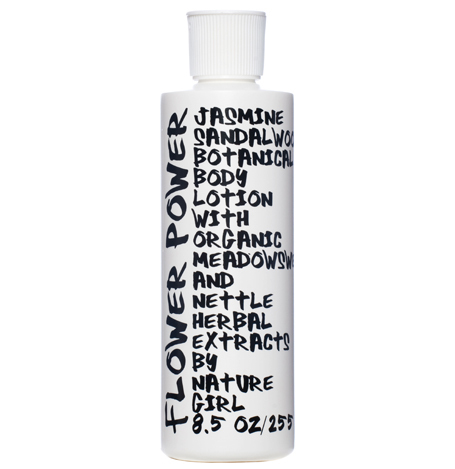 FLOWER POWER BOTANICAL BODY LOTION WITH ORGANIC HERBAL EXTRACTS CREME CORPS AVEC HUILES ESSENTIELLES ET EXTRAITS NATURELS DE PLANTES 8.5 FL.OZ 255 ML A soothing daily moisturizer made with certified organic shea butter, wildcrafted foraha nut oil and organic herbal extracts to hydrate, replenish and condition the skin. 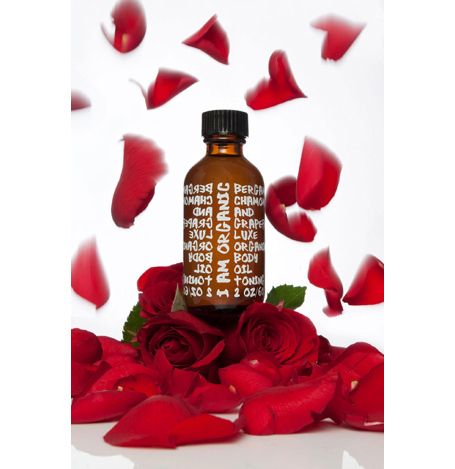 Scent: Rose Petal Directions: Apply to whole body as a daily moisturizer to nurture and protect the skin. Tangerine Botanical Body Lotion with organic herbal extracts. A soothing daily moisturizer made... 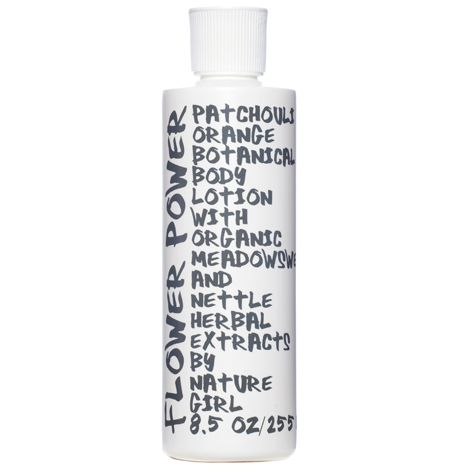 FLOWER POWER BOTANICAL BODY LOTION WITH ORGANIC HERBAL EXTRACTS CREME CORPS AVEC HUILES ESSENTIELLES ET EXTRAITS NATURELS DE PLANTES 8.5 FL.OZ 255 ML A soothing daily moisturizer made with certified organic shea butter, wildcrafted foraha nut oil and organic herbal extracts to hydrate, replenish and condition the skin. Scent: Jasmine Sandalwood Directions: Apply to whole body as a daily moisturizer to nurture and protect the skin. Tangerine Botanical Body Lotion with organic herbal extracts. A soothing daily moisturizer made... FLOWER POWER BOTANICAL BODY LOTION WITH ORGANIC HERBAL EXTRACTS CREME CORPS AVEC HUILES ESSENTIELLES ET EXTRAITS NATURELS DE PLANTES 8.5 FL.OZ 255 ML A soothing daily moisturizer made with certified organic shea butter, wildcrafted foraha nut oil and organic herbal extracts to hydrate, replenish and condition the skin. Scent: Blood Orange Directions: Apply to whole body as a daily moisturizer to nurture and protect the skin. Tangerine Botanical Body Lotion with organic herbal extracts. A soothing daily moisturizer made... FLOWER POWER BOTANICAL BODY LOTION WITH ORGANIC HERBAL EXTRACTS CREME CORPS AVEC HUILES ESSENTIELLES ET EXTRAITS NATURELS DE PLANTES 8.5 FL.OZ 255 ML A soothing daily moisturizer made with certified organic shea butter, wildcrafted foraha nut oil and organic herbal extracts to hydrate, replenish and condition the skin. Scent: Geranium Leaf Directions: Apply to whole body as a daily moisturizer to nurture and protect the skin. Tangerine Botanical Body Lotion with organic herbal extracts. A soothing daily moisturizer made... FLOWER POWER BOTANICAL BODY LOTION WITH ORGANIC HERBAL EXTRACTS CREME CORPS AVEC HUILES ESSENTIELLES ET EXTRAITS NATURELS DE PLANTES 8.5 FL.OZ 255 ML A soothing daily moisturizer made with certified organic shea butter, wildcrafted foraha nut oil and organic herbal extracts to hydrate, replenish and condition the skin. Scent: Lemon Petitgrain Directions: Apply to whole body as a daily moisturizer to nurture and protect the skin. Tangerine Botanical Body Lotion with organic herbal extracts. A soothing daily moisturizer made... FLOWER POWER BOTANICAL BODY LOTION WITH ORGANIC HERBAL EXTRACTS CREME CORPS AVEC HUILES ESSENTIELLES ET EXTRAITS NATURELS DE PLANTES 8.5 FL.OZ 255 ML A soothing daily moisturizer made with certified organic shea butter, wildcrafted foraha nut oil and organic herbal extracts to hydrate, replenish and condition the skin. Scent: Patchouli Orange Directions: Apply to whole body as a daily moisturizer to nurture and protect the skin. 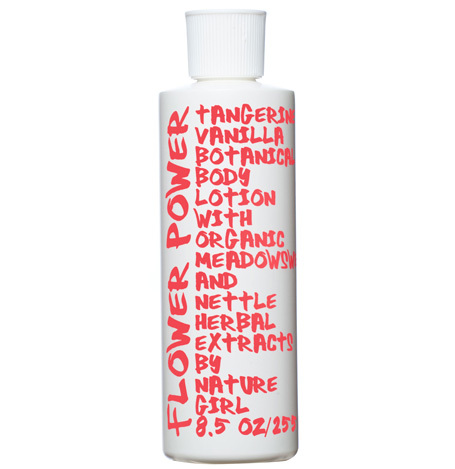 Tangerine Botanical Body Lotion with organic herbal extracts. A soothing daily moisturizer made... FLOWER POWER BOTANICAL BODY LOTION WITH ORGANIC HERBAL EXTRACTS CREME CORPS AVEC HUILES ESSENTIELLES ET EXTRAITS NATURELS DE PLANTES 8.5 FL.OZ 255 ML A soothing daily moisturizer made with certified organic shea butter, wildcrafted foraha nut oil and organic herbal extracts to hydrate, replenish and condition the skin. Scent: Rosemary Mint Directions: Apply to whole body as a daily moisturizer to nurture and protect the skin. Tangerine Botanical Body Lotion with organic herbal extracts. A soothing daily moisturizer made... 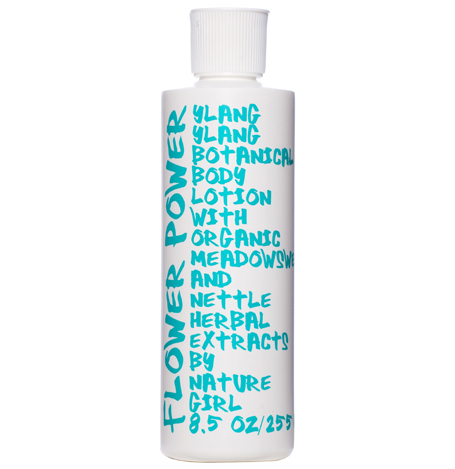 FLOWER POWER BOTANICAL BODY LOTION WITH ORGANIC HERBAL EXTRACTS CREME CORPS AVEC HUILES ESSENTIELLES ET EXTRAITS NATURELS DE PLANTES 8.5 FL.OZ 255 ML A soothing daily moisturizer made with certified organic shea butter, wildcrafted foraha nut oil and organic herbal extracts to hydrate, replenish and condition the skin. Scent: Mimosa Grapefruit Directions: Apply to whole body as a daily moisturizer to nurture and protect the skin. Tangerine Botanical Body Lotion with organic herbal extracts. A soothing daily moisturizer made... FLOWER POWER BOTANICAL BODY LOTION WITH ORGANIC HERBAL EXTRACTS CREME CORPS AVEC HUILES ESSENTIELLES ET EXTRAITS NATURELS DE PLANTES 8.5 FL.OZ 255 ML A soothing daily moisturizer made with certified organic shea butter, wildcrafted foraha nut oil and organic herbal extracts to hydrate, replenish and condition the skin. Scent: Tangerine Directions: Apply to whole body as a daily moisturizer to nurture and protect the skin. Jasmine Lime Shea butter body cream. Luxe, rich, moisturizing and soothing. Made with certified organic African... 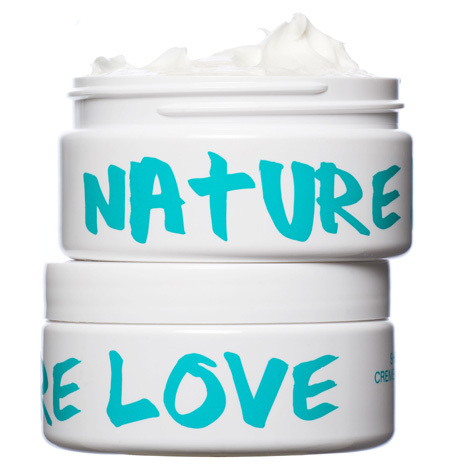 NATURE LOVE SHEA BUTTER BODY CREAM JASMINE LIME CREME CORPS AU BEURRE DE KARITE BIOLOGIQUE AVEC JASMIN ET CITRON VERT 8.5 FL OZ 255 ML Luxe, rich, moisturizing and soothing. Made with certified organic African shea butter, organic herbal extracts, organic California lavender water and organic and wildcrafted essential oils to nourish, hydrate and protect the skin. Scent: Jasmine Lime Directions:Apply to whole body as a daily moisturizer. Lavender Orris shea butter body cream. Luxe, rich, moisturizing and soothing. Made with certified... 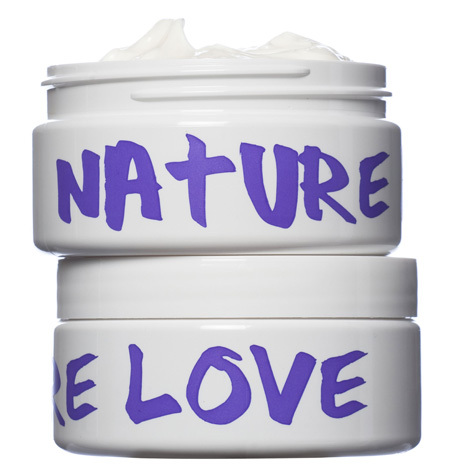 NATURE LOVE SHEA BUTTER BODY CREAM LAVENDER ORRIS CREME CORPS AU BEURRE DE KARITE BIOLOGIQUE AVEC LAVANDE 8.5 FL OZ 255 ML Luxe, rich, moisturizing and soothing. Made with certified organic African shea butter, organic herbal extracts, organic California lavender water and organic and wildcrafted essential oils to nourish, hydrate and protect the skin. Directions:Apply to whole body as a daily moisturizer. Blue Chamomile Shea butter body cream. Luxe, rich, moisturizing and soothing. Made with... 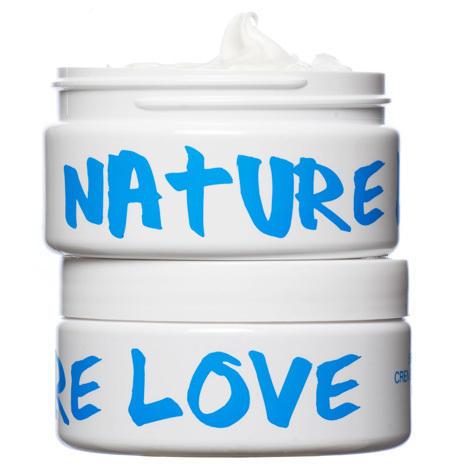 NATURE LOVE BLUE CHAMOMILE SHEA BUTTER BODY CREAM CREME CORPS AU BEURRE DE KARITE AVEC CAMOMILLE BLEU 8.5 FL OZ 255 ML Luxe, rich, moisturizing and soothing. Made with certified organic African shea butter, organic herbal extracts, organic California lavender water and organic and wildcrafted essential oils to nourish, hydrate and protect the skin. Scent: Blue Chamomile Directions:Apply to whole body as a daily moisturizer. Orange Blossom Shea butter body cream. Luxe, rich, moisturizing and soothing. Made with... 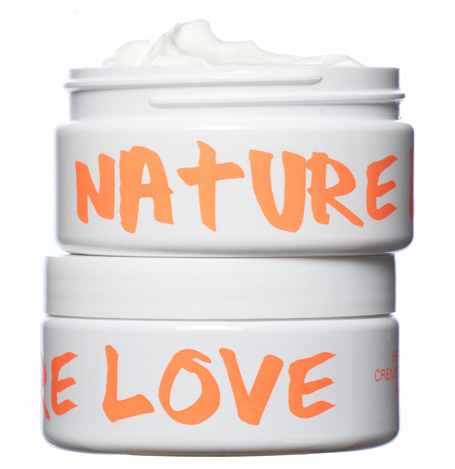 NATURE LOVE ORANGE BLOSSOM SHEA BUTTER BODY CREAM CREME CORPS AU BEURRE DE KARITE AVEC NEROLI TUNISIE 8.5 FL OZ 255 ML Luxe, rich, moisturizing and soothing. Made with certified organic African shea butter, organic herbal extracts, organic California lavender water and organic and wildcrafted essential oils to nourish, hydrate and protect the skin. Scent: Orange Blossom Directions:Apply to whole body as a daily moisturizer. Tangerine Shea butter body cream. Luxe, rich, moisturizing and soothing. Made with... 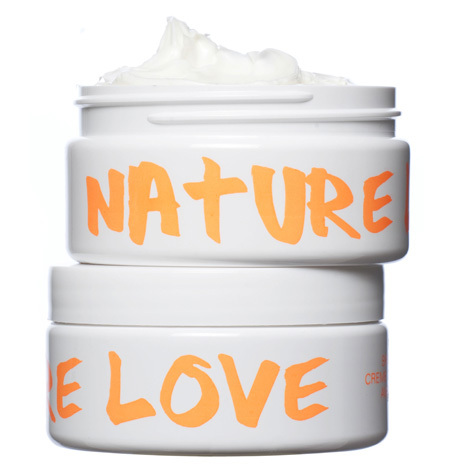 NATURE LOVE TANGERINE SHEA BUTTER BODY CREAM CREME CORPS AU BEURRE DE KARITE AVEC MANDARINE 8.5 FL OZ 255 ML Luxe, rich, moisturizing and soothing. 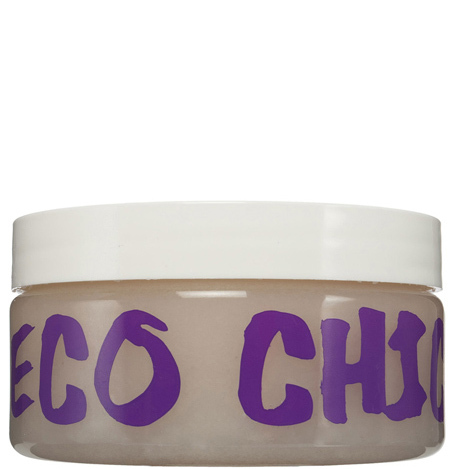 Made with certified organic African shea butter, organic herbal extracts, organic California lavender water and organic and wildcrafted essential oils to nourish, hydrate and protect the skin. Scent: Tangerine Directions:Apply to whole body as a daily moisturizer. Rosemary Mint Shea butter body cream. Luxe, rich, moisturizing and soothing. Made with... 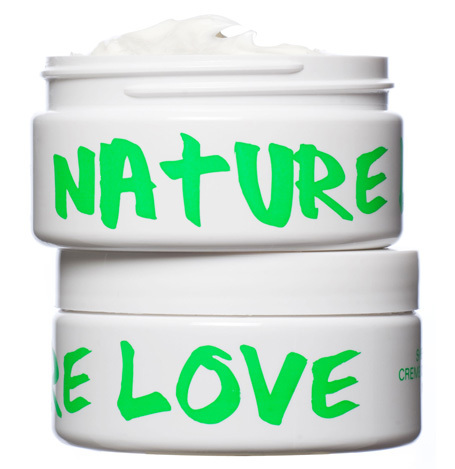 NATURE LOVE ROSEMARY MINT SHEA BUTTER BODY CREAM CREME CORPS AU BEURRE DE KARITE AVEC ROMARIN ET MENTHE 8.5 FL OZ 255 ML Luxe, rich, moisturizing and soothing. Made with certified organic African shea butter, organic herbal extracts, organic California lavender water and organic and wildcrafted essential oils to nourish, hydrate and protect the skin. Scent: Rosemary Mint Directions:Apply to whole body as a daily moisturizer. Patchouli Shea butter body cream. Luxe, rich, moisturizing and soothing. Made with certified organic African... 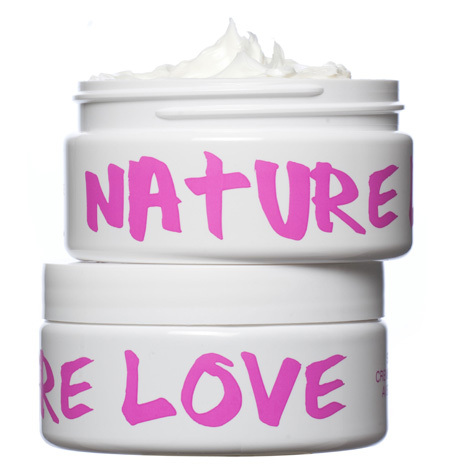 NATURE LOVE PATCHOULI SHEA BUTTER BODY CREAM CREME CORPS AU BEURRE DE KARITE AVEC PATCHOULI 8.5 FL OZ 255 ML Luxe, rich, moisturizing and soothing. Made with certified organic African shea butter, organic herbal extracts, organic California lavender water and organic and wildcrafted essential oils to nourish, hydrate and protect the skin. Scent: Patchouli Directions:Apply to whole body as a daily moisturizer. Rose Petal Shea butter body cream. Luxe, rich, moisturizing and soothing. Made with certified organic African... NATURE LOVE ROSE PETAL SHEA BUTTER BODY CREAM CREME CORPS AU BEURRE DE KARITE AVEC ROSE BULGARIE 8.5 FL OZ 255 ML Luxe, rich, moisturizing and soothing. Made with certified organic African shea butter, organic herbal extracts, organic California lavender water and organic and wildcrafted essential oils to nourish, hydrate and protect the skin. Scent: Rose Petal Directions:Apply to whole body as a daily moisturizer. Sandalwood Jasmine Shea butter body cream. Luxe, rich, moisturizing and soothing. Made with... 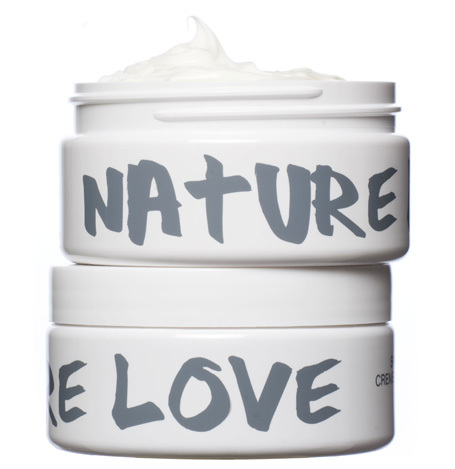 NATURE LOVE JASMINE SANDALWOOD SHEA BUTTER BODY CREAM CREME CORPS AU BEURRE DE KARITE AVEC JASMIN ET SANTAL 8.5 FL OZ 255 ML Luxe, rich, moisturizing and soothing. Made with certified organic African shea butter, organic herbal extracts, organic California lavender water and organic and wildcrafted essential oils to nourish, hydrate and protect the skin. Scent: Sandalwood Jasmine Directions:Apply to whole body as a daily moisturizer. Vanilla Litsea Shea butter body cream. Luxe, rich, moisturizing and soothing. Made with certified organic African... 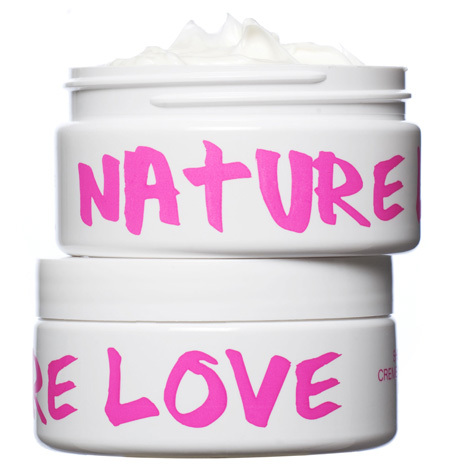 NATURE LOVE VANILLA LITSEA SHEA BUTTER BODY CREAM CREME CORPS AU BEURRE DE KARITE AVEC VANILLE ET LITSEA CUBEBA 8.5 FL OZ 255 ML Luxe, rich, moisturizing and soothing. Made with certified organic African shea butter, organic herbal extracts, organic California lavender water and organic and wildcrafted essential oils to nourish, hydrate and protect the skin. Scent: Vanilla Litsea Directions:Apply to whole body as a daily moisturizer. Ylang Ylang Shea butter body cream. Luxe, rich, moisturizing and soothing. Made with certified organic African... NATURE LOVE YLANG YLANG SHEA BUTTER BODY CREAM CREME CORPS AU BEURRE DE KARITE AVEC YLANG YLANG 8.5 FL OZ 255 ML Luxe, rich, moisturizing and soothing. Made with certified organic African shea butter, organic herbal extracts, organic California lavender water and organic and wildcrafted essential oils to nourish, hydrate and protect the skin. Scent: Ylang Ylang Directions:Apply to whole body as a daily moisturizer. Blood Orange Shea butter body cream. Luxe, rich, moisturizing and soothing. Made with certified organic African... 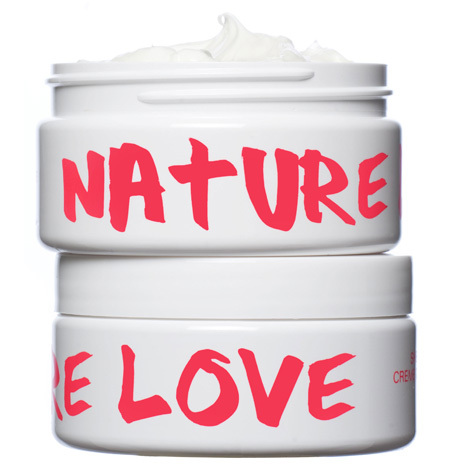 NATURE LOVE BLOOD ORANGE SHEA BUTTER BODY CREAM CREME CORPS AU BEURRE DE KARITE AVEC ORANGE SANGUINE 8.5 FL OZ 255 ML Luxe, rich, moisturizing and soothing. Made with certified organic African shea butter, organic herbal extracts, organic California lavender water and organic and wildcrafted essential oils to nourish, hydrate and protect the skin. 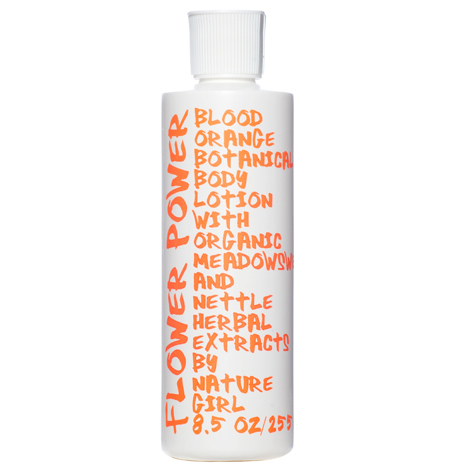 Scent: Blood Orange Directions:Apply to whole body as a daily moisturizer. 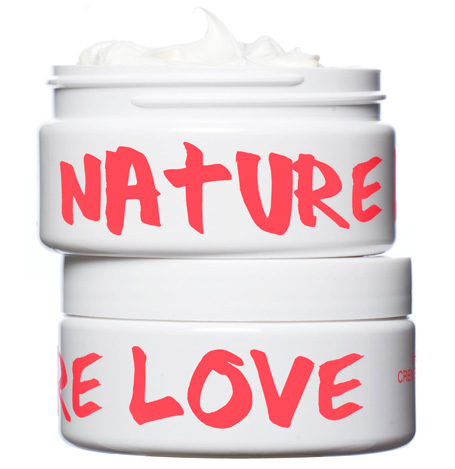 Geranium Shea butter body cream. Luxe, rich, moisturizing and soothing. Made with certified organic African... 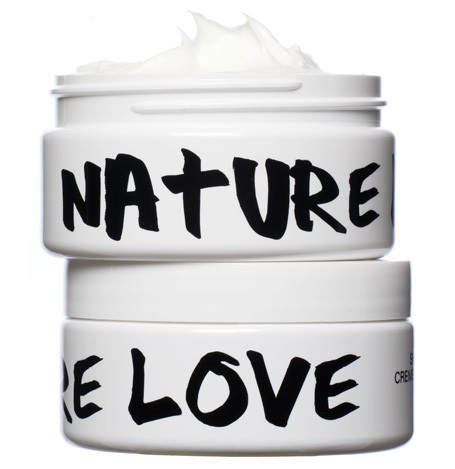 NATURE LOVE GERANIUM SHEA BUTTER BODY CREAM CREME CORPS AU BEURRE DE KARITE AVEC GERANIUM 8.5 FL OZ 255 ML Luxe, rich, moisturizing and soothing. Made with certified organic African shea butter, organic herbal extracts, organic California lavender water and organic and wildcrafted essential oils to nourish, hydrate and protect the skin. Scent: Geranium Directions:Apply to whole body as a daily moisturizer. Lemon Petitgrain Shea butter body cream. Luxe, rich, moisturizing and soothing. Made with... 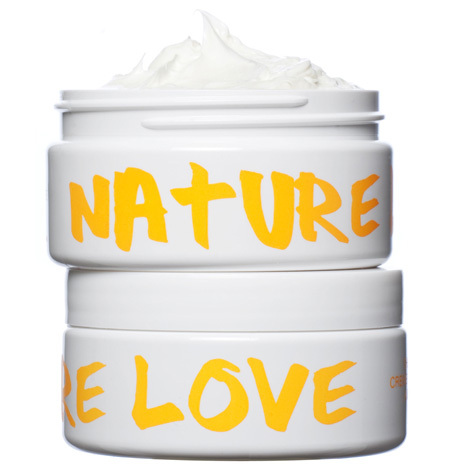 NATURE LOVE LEMON PETITGRAIN SHEA BUTTER BODY CREAM CREME CORPS AU BEURRE DE KARITE AVEC CITRON ET PETITGRAIN 8.5 FL OZ 255 ML Luxe, rich, moisturizing and soothing. Made with certified organic African shea butter, organic herbal extracts, organic California lavender water and organic and wildcrafted essential oils to nourish, hydrate and protect the skin. Scent: Lemon Petitgrain Directions:Apply to whole body as a daily moisturizer. 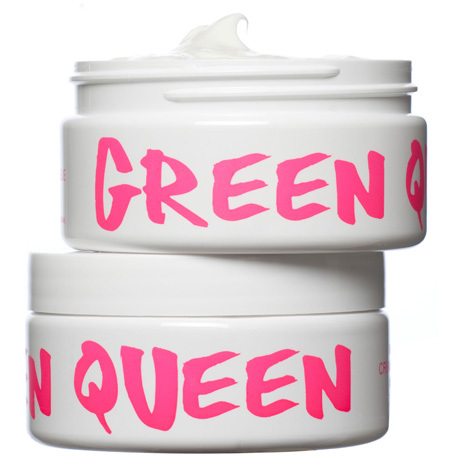 Jasmine Lime Mango Butter Body Cream. 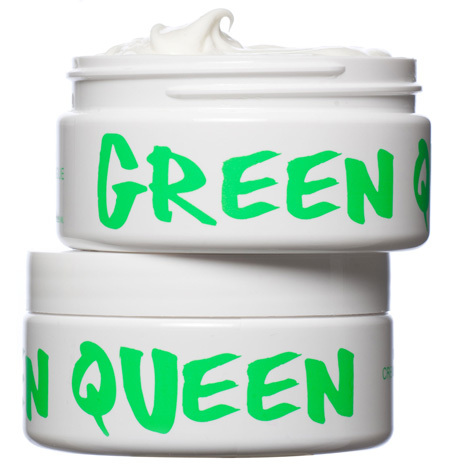 A luxe and moisturizing body cream made with.... GREEN QUEEN JASMINE LIME MANGO BUTTER BODY CREAM CREME CORPS AU BEURRE DE MANGUE AVEC JASMIN ET CITRON VERT 8.5 FL.OZ. 255 ML A luxe and moisturizing body cream made with soothing mango butter, certified organic foraha seed extract, healing herbal infusions and extracts from organic and wildcrafted plants and flowers. Directions:Apply to whole body as a daily moisturizer. Lavender Orris Mango Butter Body Cream. 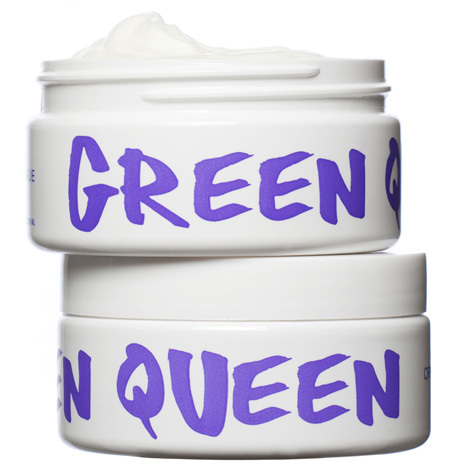 A luxe and moisturizing body cream made with.... GREEN QUEEN LAVENDER ORRIS MANGO BUTTER BODY CREAM CREME CORPS AU BEURRE DE MANGUE AVEC LAVANDE ET IRIS 8.5 FL.OZ. 255 ML A luxe and moisturizing body cream made with soothing mango butter, certified organic foraha seed extract, healing herbal infusions and extracts from organic and wildcrafted plants and flowers. Directions:Apply to whole body as a daily moisturizer. Blue Chamomile Mango Butter Body Cream. 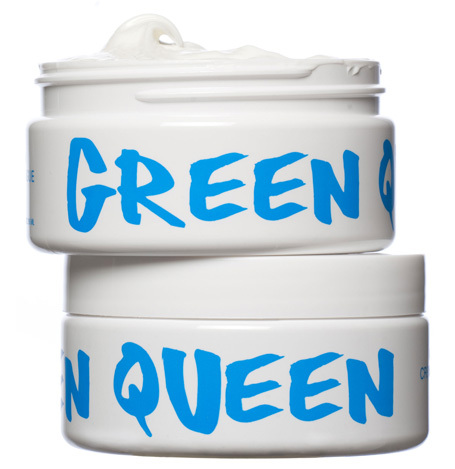 A luxe and moisturizing body cream made with.... GREEN QUEEN BLUE CHAMOMILE MANGO BUTTER BODY CREAM CREME CORPS AU BEURRE DE MANGUE AVEC CAMOMILLE BLEU 8.5 FL.OZ. 255 ML A luxe and moisturizing body cream made with soothing mango butter, certified organic foraha seed extract, healing herbal infusions and extracts from organic and wildcrafted plants and flowers. Directions:Apply to whole body as a daily moisturizer. Orange Blossom Mango Butter Body Cream. A luxe and moisturizing body cream made with.... GREEN QUEEN ORANGE BLOSSOM MANGO BUTTER BODY CREAM CREME CORPS AU BEURRE DE MANGUE AVEC NEROLIE TUNISIE 8.5 FL.OZ. 255 ML A luxe and moisturizing body cream made with soothing mango butter, certified organic foraha seed extract, healing herbal infusions and extracts from organic and wildcrafted plants and flowers. Directions:Apply to whole body as a daily moisturizer. Tangerine Mango Butter Body Cream. 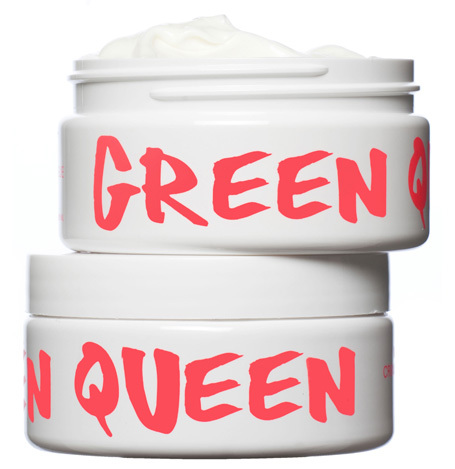 A luxe and moisturizing body cream made with.... GREEN QUEEN TANGERINE MANGO BUTTER BODY CREAM CREME CORPS AU BEURRE DE MANGUE AVEC MANDARINE 8.5 FL.OZ. 255 ML A luxe and moisturizing body cream made with soothing mango butter, certified organic foraha seed extract, healing herbal infusions and extracts from organic and wildcrafted plants and flowers. Directions:Apply to whole body as a daily moisturizer. Jasmine Lime Organic Sugar Scrub. Luxe, exfoliating, toning, hydrating. 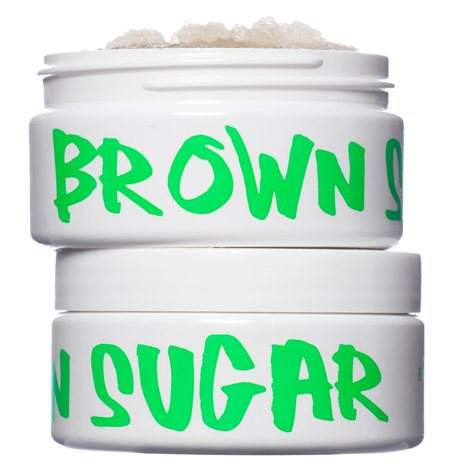 A luxurious overall... BROWN SUGAR JASMINE LIME ORGANIC SUGAR SCRUB EXFOLIANT BIO AU SUCRE ROUX AVEC JASMIN ET CITRON VERT Luxe, exfoliating, toning, hydrating. 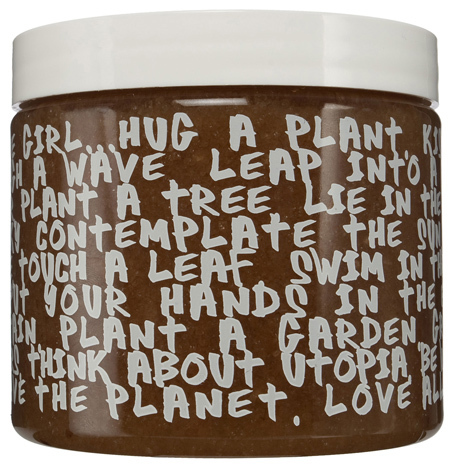 A luxurious overall organic body exfoliator made with only the highest quality Brazilian brown sugar, certified organic oils of jojoba seed, sunflower seed, safflower, olive and calendula flower and infused with healing and nurturing plant and flower extracts. Directions: Rub a small handful onto wet skin and rinse. Repeat to condition entire body. Lavender Orris Organic Sugar Scrub. 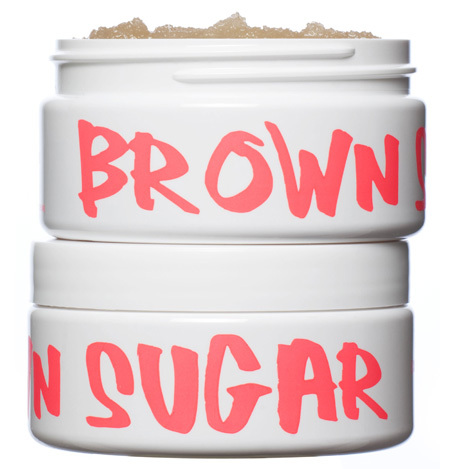 Luxe, exfoliating, toning, hydrating. 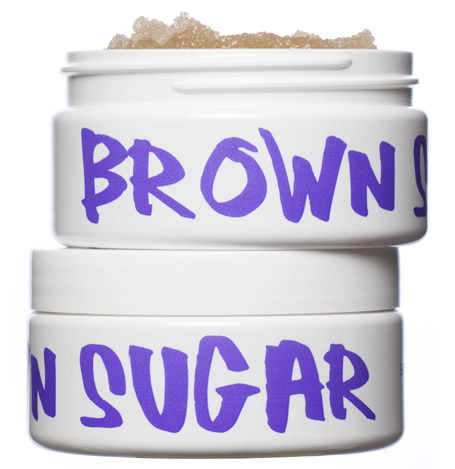 A luxurious overall... BROWN SUGAR LAVENDER ORRIS ORGANIC SUGAR SCRUB EXFOLIANT BIO AU SUCRE ROUX AVEC LAVANDE ET IRIS Luxe, exfoliating, toning, hydrating. A luxurious overall organic body exfoliator made with only the highest quality Brazilian brown sugar, certified organic oils of jojoba seed, sunflower seed, safflower, olive and calendula flower and infused with healing and nurturing plant and flower extracts. Directions: Rub a small handful onto wet skin and rinse. Repeat to condition entire body. Blue Chamomile Organic Sugar Scrub. Luxe, exfoliating, toning, hydrating. 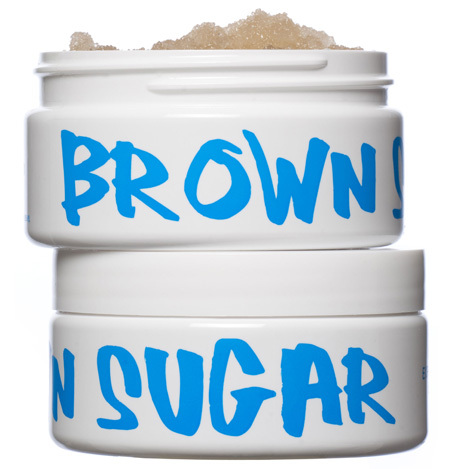 A luxurious overall... BROWN SUGAR BLUE CHAMOMILE ORGANIC SUGAR SCRUB EXFOLIANT BIO AU SUCRE ROUX AVEC CAMOMILLE BLEU Luxe, exfoliating, toning, hydrating. A luxurious overall organic body exfoliator made with only the highest quality Brazilian brown sugar, certified organic oils of jojoba seed, sunflower seed, safflower, olive and calendula flower and infused with healing and nurturing plant and flower extracts. Directions: Rub a small handful onto wet skin and rinse. Repeat to condition entire body. Orange Blossom Organic Sugar Scrub. Luxe, exfoliating, toning, hydrating. 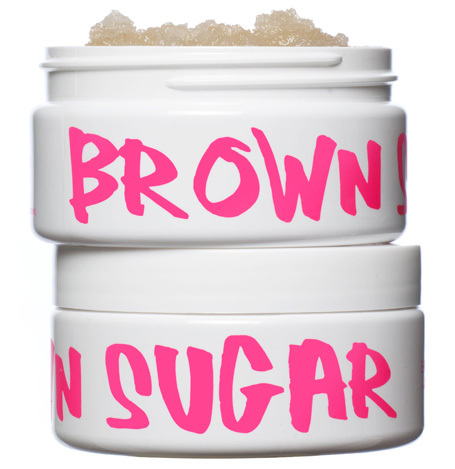 A luxurious overall... BROWN SUGAR ORANGE BLOSSOM ORGANIC SUGAR SCRUB EXFOLIANT BIO AU SUCRE ROUX AVEC NEROLI TUNISIE Luxe, exfoliating, toning, hydrating. A luxurious overall organic body exfoliator made with only the highest quality Brazilian brown sugar, certified organic oils of jojoba seed, sunflower seed, safflower, olive and calendula flower and infused with healing and nurturing plant and flower extracts. Directions: Rub a small handful onto wet skin and rinse. Repeat to condition entire body. Tangerine Organic Sugar Scrub. Luxe, exfoliating, toning, hydrating. A luxurious overall... BROWN SUGAR TANGERINE ORGANIC SUGAR SCRUB EXFOLIANT BIO AU SUCRE ROUX AVEC MANDARINE Luxe, exfoliating, toning, hydrating. A luxurious overall organic body exfoliator made with only the highest quality Brazilian brown sugar, certified organic oils of jojoba seed, sunflower seed, safflower, olive and calendula flower and infused with healing and nurturing plant and flower extracts. Directions: Rub a small handful onto wet skin and rinse. Repeat to condition entire body. 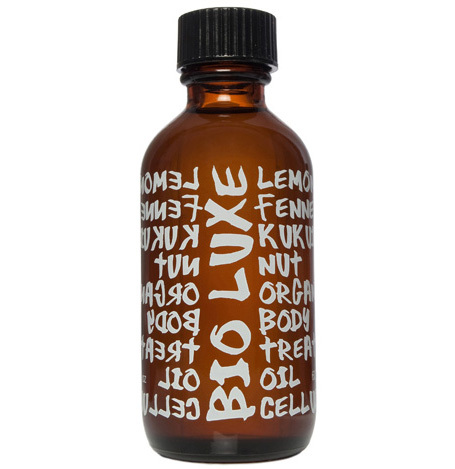 Luxe organic body oil. Soothing, luxe, moisturizing. Made with organic golden jojoba seed oil, organic... I AM ORGANIC LUXE ORGANIC BODY OIL HUILE TONIQUE AVEC HUILES ESSENTIELLES BIOLOGIQUES POUR LE CORPS 2 FL.OZ 60 ML Soothing, luxe, moisturizing. Made with organic golden jojoba seed oil, organic sweet almond oil, organic calendula oil, organic African shea butter oil and organic and wildcrafted essential oils to hydrate, enrich and protect the skin. Each synergy features over twenty specially selected essential oils. Synergies: Toning - Infused with Bergamot, Chamomile & Grapefruit Relaxing - Infused with Sage Leaf & Geranium Contouring - Infused with Cypress, Grapefruit & Juniper Directions: Massage gently into moist skin after a warm bath or shower. Kukui nut organic body treatment oil. A luxurious rich and hydrating body treatment oil made with organic... BIO LUXE KUKUI NUT ORGANIC BODY TREATMENT OIL HUILE TONIQUE BIOLOGIQUE AVEC KUKUI 2 FL.OZ 60 ML A luxurious rich and hydrating body treatment oil made with organic and wildcrafted oils of kukui, hazelnut, calendula, olive and shea butter and infused with organic and wildcrafted essential oils to enhance and nourish skin. Synergies: Lemon & Fennel - for cellulite Juniper & Coriander - toning Lavender & Geranium - relaxing Directions:Gently massage into skin after a warm bath or shower. Organic salt scrub. Rich and elegant, made with the highest quality organic and wildcrafted... ECO CHIC ORGANIC SALT SCRUB GOMMAGE TONIQUE CORPS AVEC SEL DE MER ET HUILES ESSENTIELLES 8.5 FL.OZ 255 ML Scents: Pink Grapefruit Lavender Flower Eucalyptus Ginger & Orange Rich and elegant, made with the highest quality organic and wildcrafted flower and plant oils to exfoliate, condition, tone and moisturize the skin. Directions:Rub a small handful onto wet skin and rinse. Repeat to condition entire body. Lemon peel organic sugar scrub. Luxe, moisturizing and conditioning. Made with... 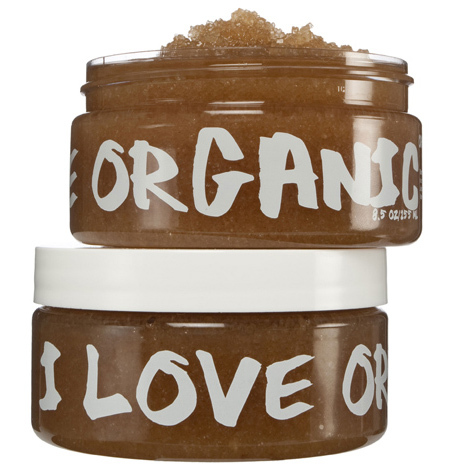 I LOVE ORGANIC LEMON PEEL ORGANIC SUGAR SCRUB GOMMAGE TONIQUE CORPS AVEC SUCRE ET HUILES ESSENTIELLES 8.5 FL.OZ 255 ML Luxe, moisturizing and conditioning. Made with certified organic oils of jojoba seed, calendula and sunflower, certified organic Brazilian brown sugar and certified organic citrus oils to detoxify and cleanse. Directions:Rub a small handful onto wet skin and rinse. Repeat to condition entire body. Lemon peel organic sugar scrub. Luxe, moisturizing and conditioning. Made with... GENERATION NATURE LEMON PEEL ORGANIC SUGAR SCRUB GOMMAGE TONIQUE CORPS AVEC SUCRE ET HUILES ESSENTIELLES 18 FL.OZ 540 ML Luxe, moisturizing and conditioning. Made with certified organic oils of jojoba seed, calendula and sunflower, certified organic Brazilian brown sugar and certified organic citrus oils to detoxify and cleanse. Directions:Rub a small handful onto wet skin and rinse. Repeat to condition entire body. Organic golden jojoba bath and body oil. A naturally rich and hydrating overall body... 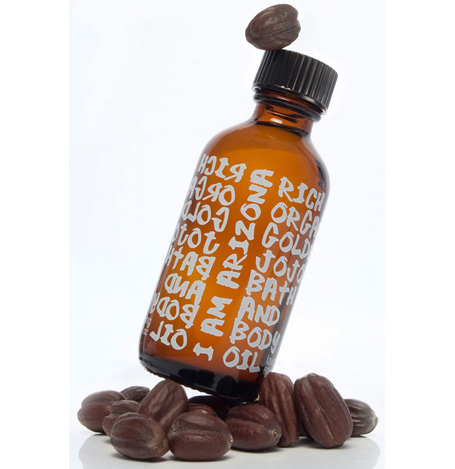 I AM ARIZONA ORGANIC GOLDEN JOJOBA BATH AND BODY OIL HUILE TONIQUE AVEC JOJOBA BAIN ET CORPS 2 FL.OZ 60 ML Scents: Unscented Lavender Flower A naturally rich and hydrating overall body moisturizer made with organic golden jojoba oil from the Arizona desert. Healing and balancing. Directions:Massage a generous amount into skin after a warm bath or shower or add one tablespoon to warm running bath water. Can be used as a deep conditioning hair and scalp treatment as well, prior to sitting in a steam room or sauna.